On October 16, 1805, the Lewis and Clark Expedition camped in the Pasco area, at a site now commemorated by Sacajawea State Park. The area was frequented by fur trappers and gold traders. In the 1880s, the Northern Pacific Railway was built near the Columbia River, bringing many settlers to the area. Pasco was officially incorporated on September 3, 1891. It was named by Virgil Bogue, a construction engineer for the Northern Pacific Railway after Cerro de Pasco, a city in the Peruvian Andes, where he had helped build a railroad. In its early years, it was a small railroad town, but the completion of the Grand Coulee Dam in 1941 brought irrigation and agriculture to the area. The Franklin County courthouse in Pasco. Due in large part to the presence of the Hanford Site, the entire Tri-Cities area grew rapidly from the 1940s through 1950s. However, most of the population influx resided in Richland and Kennewick, as Pasco remained primarily driven by the agricultural industry, and to a lesser degree the NP Pasco rail yards. After the end of World War II, the entire region went through several "boom" and "bust" periods, cycling approximately every 10 years and heavily based on available government funding for Hanford-related work. Farming continues to be the economic driver for most of the city's industrial tax base. In the late 1990s, foreseeing another Hanford-related boom period, several developers purchased large farm circles in Pasco for residential and commercial development. Since that time, Pasco has undergone a transformation that has not only seen its population overtake the neighboring city of Richland, but also has resulted in growth in the city's retail and tourism industries. Recently incorporated land on the West side of the city has exploded into new housing tracts, apartments, and shopping centers. This area of the city has become referred to locally as "West Pasco", distinguishing it from the older area of town to the East. In addition to an influx of new residents to the region, many residents of the Tri-Cities have moved from Richland and Kennewick to West Pasco due to its central location and virtually all-new housing and business. Pasco is located at (46.238507, -119.108534). According to the United States Census Bureau, the city has a total area of 34.08 square miles (88.27 km2), of which, 30.50 square miles (78.99 km2) is land and 3.58 square miles (9.27 km2) is water. As Pasco is located in Southeastern Washington, the city lies in the rain shadow of the Cascade Range. As a result, the area is a windswept desert, receiving little precipitation throughout the year. Hot summers, warm springs, and cold winters provide a stark contrast to other areas of the state. The massive Columbia River borders the south side of the city, separating it from the neighboring cities of Richland and Kennewick. As of the census of 2010, there were 59,781 people, 17,983 households, and 13,863 families residing in the city. The population density was 1,960.0 inhabitants per square mile (756.8/km2). There were 18,782 housing units at an average density of 615.8 per square mile (237.8/km2). The racial makeup of the city was 55.8% White, 1.9% African American, 0.5% Native American, 1.9% Asian, 0.1% Pacific Islander, 36.4% from other races, and 3.3% from two or more races. Hispanic or Latino of any race were 55.7% of the population. There were 17,983 households of which 51.3% had children under the age of 18 living with them, 55.1% were married couples living together, 14.9% had a female householder with no husband present, 7.1% had a male householder with no wife present, and 22.9% were non-families. 17.0% of all households were made up of individuals and 5.3% had someone living alone who was 65 years of age or older. The average household size was 3.30 and the average family size was 3.73. The median age in the city was 27.3 years. 35.5% of residents were under the age of 18; 10.6% were between the ages of 18 and 24; 29.9% were from 25 to 44; 17.2% were from 45 to 64; and 6.7% were 65 years of age or older. The gender makeup of the city was 50.7% male and 49.3% female. As of the census of 2000, there were 32,066 people, 9,619 households, and 7,262 families residing in the city. The population density was 1,141.9 people per square mile (440.9/km²). There were 10,341 housing units at an average density of 368.2 per square mile (142.2/km²). The racial makeup of the city was 52.76% White, 3.22% African American, 0.77% Native American, 1.77% Asian, 0.14% Pacific Islander, 37.44% from other races, and 3.9% from two or more races. Hispanic or Latino of any race was 56.26% of the population. In the city, the age distribution of the population shows 35.5% under the age of 18, 11.8% from 18 to 24, 28.5% from 25 to 44, 15.5% from 45 to 64, and 8.7% who were 65 years of age or older. The median age was 27 years. For every 100 females, there were 106.7 males. For every 100 females age 18 and over, there were 104.2 males. 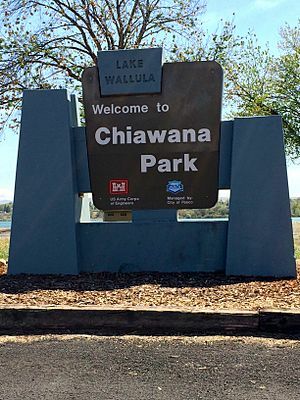 Sign for Chiawana Park in Pasco, Washington. 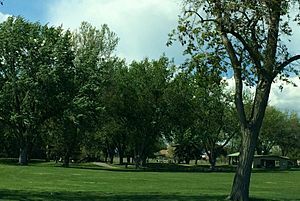 Chiawana Park in Pasco, Washington. Among all of Pasco's annual activities and events, the most popular is the Pasco Farmers Market, located in downtown Pasco. The market is open from May through October each year, drawing a large regional crowd and providing an outlet for farmers selling fresh produce. The Fiery Foods Festival is another popular event held each September. This one-day event celebrates spicy foods of all varieties, and highlights the thriving Hispanic culture that lives in the city. Pasco's Gesa Stadium hosts the Tri-City Dust Devils baseball club of the Northwest League. The Dust Devils are a Class A team of the San Diego Padres. The team plays during summer months during its short season. The Pasco School District's renovated Edgar Brown Memorial Stadium, constructed in a former gravel pit used in the construction of the Blue Bridge, provides a unique venue for outdoor athletic events. Pasco is located along a major stretch of the 22-mile Sacagawea Heritage Trail, an interactive educational and recreational hiking/biking loop that circles the Tri-Cities area. Pasco has several waterfront parks along the Columbia River, as well as easy river access for boaters, fishers, and skiers at any of the free boat launches. The TRAC (Trade Recreation Agricultural Center) is a large complex located in West Pasco which hosts regional events, including (but not limited to) conventions, meetings, sporting events, and concerts. The TRAC is located near the booming Road 68 corridor of West Pasco. Pasco Intermodal Train Station, a stop on Amtrak's Empire Builder, with daily service to Portland and then Seattle westbound, to Spokane, St Paul, and Chicago eastbound, both with many intermediate points and connections. Tri-Cities Airport, with commercial service to Seattle-Tacoma, Las Vegas, Phoenix, Salt Lake City, San Francisco, Minneapolis-St. Paul, Los Angeles, and Denver. Lampson Crane yard, Port of Big Pasco, in Pasco. Pasco, Washington Facts for Kids. Kiddle Encyclopedia.